Backstitch is one of the basic stitches used to attach beads to a beading foundation in bead embroidery. The stitch involves doing a regular forward stitch through one or more beads and then stitching back through a portion of the beads to make sure they are secure. Backstitch can be used with most types of beads and can be varied slightly, depending on the size of the beads you are using and the size of the area that you need to cover with beads. If your beads are covering a small area, you will want to do backstitch with one or two beads, which will allow them to fit precisely. If you have a larger area to cover, it is perfectly fine to pick up four or five beads in a stitch and back stitch through the last two, especially if you go through the bead stitch a second time just to align and secure the beads. There are many material options that you can choose from when doing bead embroidery. The basic types of bead embroidery materials are described in this article and you can find more information about those materials at the links provided. You will need a piece of embroidery foundation, slightly larger than the project you are stitching. Most embroidery foundations are white, but there are some that are available in colors that may blend better with your project. You may choose to draw a design or basic shape on the foundation or print an outline on a peel and stick wash-away stitch stabilizer. You don't need the wash-away kind, especially if you don't plan on washing your bead embroidery. There are a variety of stitch stabilizers available and they work well when your embroidery foundation needs to be made a little stiffer to support the stitches or you want to print a design on your foundation. In addition, you will need a variety of beads, a beading needle, beading thread, and embroidery scissors to trim the thread ends. Cut a comfortable length of beading thread. If you are using a nylon beading thread like Nymo, pre-stretch it before stitching. Tie a small knot at one end of the thread and add a beading needle on the other end. Working from the backside of the embroidery foundation material (the side that does not have the pattern drawn on it), insert your needle up through the foundation material and pull so that the knot is flush against the back. Pick up two seed beads and push them down against the beading foundation. Line the beads up on your pattern or guideline and look to see where the thread is exiting the second bead. Pass your needle straight down (don't angle it!) into the embroidery foundation at the point where the thread exits the second bead. Try to keep an even tension - don't pull too tightly when stitching or your bead embroidery foundation material may pucker and your beads will not lie straight. Working from the back of the embroidery foundation, estimate the size of one of your seed beads and pass your needle up through the embroidery foundation one bead length back from where you came down in the previous step. Your needle should be coming up between the two beads you just added. You don't have to get the spacing exactly correct. If your space is a little too big or too small, it won't really matter. You'll get better at judging the size of your beads as you work. After you pull your thread up through the embroidery foundation to the working side, pass your needle through the second bead you added. Pull your thread through to be in a position to pick up more beads. Remember not to pull too tightly to prevent your bead embroidery foundation material from puckering as you work. Pick up two more seed beads and push them down against the embroidery foundation next to the first two that you just added. Line them up along your pattern if you are using one and stitch through the fabric to secure them in the same way. When you come to the end of the row, secure the last bead or beads and then pass your needle down into the embroidery foundation right in front of the last bead that you added. If you feel like the beads are a little loose or can wiggle out of place, you can stitch back between the last two beads you added, then through the entire row of beads and back into the embroidery foundation. Don't pull the thread too tight; you just want to secure and align the beads, not pull them out of position. When starting a new row of seed beads, estimate the width of one of the seed beads that you will be adding in this row. Bring your needle up through the embroidery foundation where the hole of the bead will line up to position the bead in the right spot. When adding additional rows, you don't want to bring your needle up directly against the row of seed beads that you just stitched. This will crowd the rows of beads and they won't lie straight. Pick up two more seed beads and add them in the same manner as you added the beads for the first row. 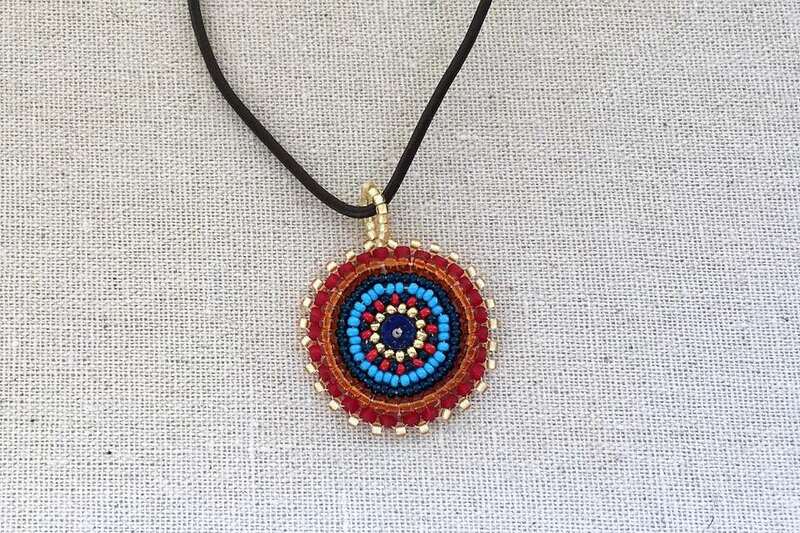 You can use bead embroidery to create all kinds of beaded jewelry, including rings, bracelets, necklaces, and earrings as well as other beaded wearables like belts, belt buckles, hair ties, and straps for musical instruments like guitars. When working bead embroidery, let your imagination help you choose the beads that you use. Vary the sizes, shapes, and colors to add texture and interest to your bead embroidery.